I am over the moon excited to give you a first look at Alpine Carolers, the set I designed in collaboration with Mama Elephant. They are showing it off on their blog today too - click! I couldn't help but pair the littlest girl from the set (in her bear coat and tiny ugg boots) with a figgy pudding cupcake. 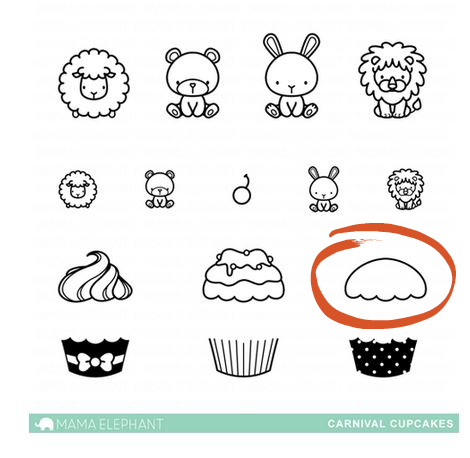 I stamped the liner first, the one in the middle, and then did some selective inking on the cupcake top with the scalloped bottom (the one I circled.) I inked it up and completely wiped off the ink from the bottom before stamping down. With a copic multiliner, I drew a straighter line to fill in the bottom, and gave it the drippy line for the white glaze you'd see on a figgy pudding cake. For the mistletoe topper, I inked up the floral cluster from Carnival Toppers (circled above) but wiped off the ink from the flower before stamping down. Three hand-drawn circles created the signature berries. I love the whimsical fonts that Kryssi chose for the set (that is not my area of expertise at all!) I inked up part of the sentiment at a time, so that it would frame the image. I created another card for the Mama Elephant blog today - click over to see it in full! I'd love to know what you think of Alpine Carolers so far! Leave me a comment on this post and I'll make it worth your while: I have an extra set to give away to one of you. I'll leave it open until midnight on the 17th (EST) and announce the winner later that same day. Super cute cards and this looks like a great set. Congrats! Adorable cards! And thanks for a chance to win! Oh, the carolers are so detailed and sweet, and bring back so many memories of childhood caroling. Aww... The smallest girl with her gigantic cupcake... <3 She looks so proud! Your set is absolutely adorable, Elena! Congrats on your first stamp set - its so adorable! Wow! Such a darling set! I love music themed Christmas sets! How sweet, I love your new stamps! Adorable stamp set! I'm on love with it! Can't wait! Your cards are adorable! Congratulations on your new stamp set, Elena!!! It looks absolutely ADORABLE!! Love both of your sample cards too----soooo super duper cute! aww this could not be any cuter.. what a great set Elena.. big congrats to you... I SOOOO LOVE IT.. This is an awesome stamp set you designed...congrats! Congratulations in entering the design world, Elena! So exciting! Your new carolers are just adorable and your projects are fantastic!! You have a new fan in me! *Waving all the way from Singapore! Fantastic job on both the stamps and cards. So much Christmas cheer! Such cute stamps and love the cards you made with them both here and on thevMamaElephant blog. Adorable! Looks like this will be a must have set! I seriously LOVE these little Carolers! And that figgy pudding you made is fantastic!! Great projects! Eeeek, this set is a must have! LOVE how you created figgy pudding for the kiddies and that second scene is just fab-u-lous!! Wow, great cards. I'm absolutely amazed. From all I've seen from the new ME release the Alpine Carolers are my ultimate favorite. And I'd love to see much much more cards with this set. I am in love with this set! Amazing job! These cards are gorgeous! So adorable!! Love your set so much, it's super sweet! And you're right, the fonts are just perfect! Emily sent me over to see your set and your cards... absolutely adorable! Looking forward to the full reveal now. I love how you transformed the cupcake into a festive foggy pudding. Congrats Elena! Your stamp designs are the cutest! I can't wait to make holiday cards with this set. You are a genius Elena!!! Congratulations on Alpine Carolers!! So adorable!! What a bunch of adorable carolers. So cute (love the UGGs). Didn't know you were such an artist but I do now. All your cards are fantastic. Your Alpine Carolers are so adorable! Congratulations for getting them into stamps. Your cards are cute. Oh my.... just adorable! I love every little detail! Love your little Alpine Carolers, they are so stinkin' adorable!! Congratulations!!!! So happy to see your first new set (of many i hope! )...these examples are so sweet! love it and Congrats! Congratulations on your stamp designs! They are super adorable! You are an amazing designer. Super sweet card, loving the carolers! Absolutely adorable Elena! You are quite the artist :)! I love your cards and this set is just amazing! Adding my voice to the others in cheering your new stamp set; simply amazing! You showcase cards are pure delights! The carolers are darling! I would love to win. Love your drawing style! Such a sweet set! What a darling design - so so cute! Wonderful stamp set Elena, and beautiful outcome - it is quite adorable. This is the beginning to an exciting journey! Lovely set!! And super awesome that you had the opportunity to design it! Congrats on this sweet new set! Love it! Oh my word, this set has definately got to be a must have, I'm sure it will be a sell out! Amazing designs Elena, thanks for the chance to win! So cute Elena!! Awesome work. Congratulations! Love your Alpine Carolers Elena! and the cards you made with them. Spreading Christmas cheer for all to hear! : ) Love your creativity with the other stamp sets too. So fun! It's the most wonderful time of the year! this set is so adorable! what a great design! Oh such darling cards!! I just absolutely LOVE the cute images and all the wonderful possibilities! I am definitely going to buy this set. Thanks for the inspiration! SUPER SWEET AWESOMENESS! This set really is fabulous can't wait to see it in it's entirety! God bless! Absolutely adorable cards! Sweet designs.... love them! Can't wait to see more! Love this set of stamps and can't wait to get my hands on it! congrats to you!! I love, love, love this set! That card is so darn cute! TFS! I love both of these, such wonderful designs and I especially love that pretty blue/snowing background for your second card. And thanks so much for the chance to win the set!! I adore the Carolers stamp set. It is my favorite release! I cannot wait to order it! 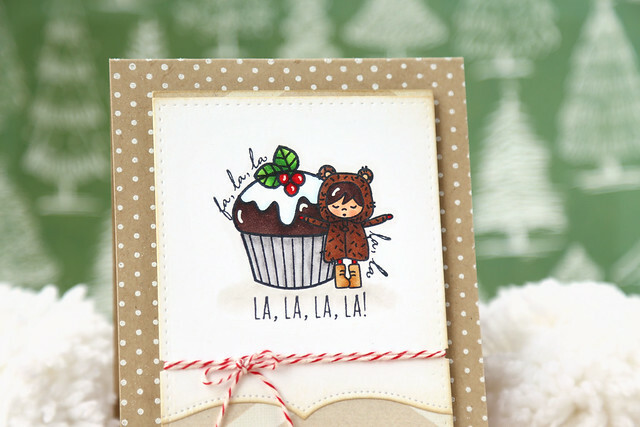 Love how you used the other stamp sets to compliment the caroler!! Sooo cute!!! Absolutely adorable! I love your work. I am in love with these little people...I love that their eyes are closed! So sweet! This is an adorable set of stamps. Your cards show case them beautifully. TFS you talent!! 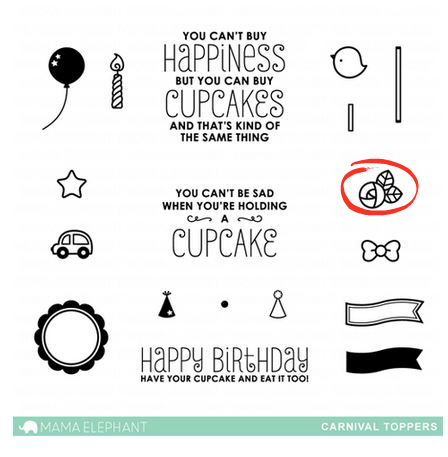 I like the different combinations for the cupcakes and different cute creatures. Absolutely adorable set and cards! Elena, what a wonderful set! This is the first time I'm going to be buying on release night thanks to it :) I think it has a Canadian flair. Congrats!! How clever with the cupcake! The lil caroler in her Ugg boots is too cute! Love this set! Thank you for a chance to win. Congradulation on you're beautiful stamp set! The Alpine Carolers are just adorable! Love you're cards but especialls the carolers alone in the snow. So, so sweet. Congratulations! Love the little carolers….. This stamp set is adorable! Love the cards you made using it!! Yay! I've been looking for kids in winter garb- these are the cutest! thanks for making them! I absolutely LOVE the little girl in the bear coat...total cute overload!! Oh my GOSH! so stinkin cute I can't even stand it. Your cards are divine. Congrats on the set. h these are such cute little people! Congratulations!!!! Love this new set! This is the cutest!!! I just discovered Mama Elephant today!!!!!! Adorable! Got my first set and would love to stamp with many more of the designs. Your carolers are adorable! Great job! You must be very excited! Elena, you must be so thrilled and proud of this amazing set!! I adore these characters, and the cards you've created with them are fabulous! beautiful card! :) it's really cute! How adorable! I just love them! Those cards are so cute! Love how you use the stamps in different ways. Very creative! Super cute!! I'll be buying it for sure! Super cute!! I really love the fasting in the cupcake too. So very creative!! so adorable!! Love that little girl with her cozy winter coat and boots and especially love the way you put together the customized Christmas cupcake! I love your sweet carolers! Super cute card design! These are adorable, the stamps and the cards!!! These are just so cute! I'm so so happy for you!!! Sweet cards - love the images. This set is so stinkin' cute with all the fun details...love the Uggs! So so very cute! Loving that fun sentiment too!!! Shoot! I thought for sure I had already commented here!! Your cards are so adorable and sweet!! I LOVE how you altered some of the sets and made the images it your vision perfectly!!! I am so excited for you and your new journey!! How sweet are those two?!! Love all the tiny details you included too! The Alpine Carolers is one of the sets that really caught my eyes. It reminds me of the Russian dolls for some reason. I love how you mix the cupcake with the caroler, and utilizing stamp images from non-holiday related sets to create a totally different effect. Thanks for sharing. Very cute cards with these stamps. I like how you altered the stamped images. Super cute cards! Love this set!! Somehow I haven't commented on this post yet! WHAT?! Anyway, super cute cards and, again, amazing new stamp set! HUGE congratulations to you!!!! I am in LOVE!!!!!! This is such an adorable stamp set! Love the details of your beautiful illustrations! Adorable! I especially like how you did the cupcake. This is just a cute stamp set. Love the images. Congrats on the release. Cute! I love how you altered your cupcake! Wow congrats on the stamp set. You did an awesome job, the Alpine are so cute! These carolers are absolutely sensational! What a great stamp set and your cards a WONDERFUL! What a fun set and your card is fantastic! Thank you for showing us where you pulled the other stamps from that you used too! I love your cards and this set is a keeper! How adorable!! I love how you mix and match the stamps. Just to cute!!! Thanks for sharing!!! What a cute stamp set. Your cards are so adorable. Love your color choices too. Thanks for a chance to win. Love all the cards and colors in them. I love how you stretched the carnival stamps to make it xmas-y! Great idea and fantastic card! Your cards are so adorable. Thanks so much for a chance to win. The set is so cute! Lovely! Great revamping of the cupcake! Super cute! I am really excited for this release! LOVE the Awesome cards, instructions. More great cards! I liked how you used another set most people wouldn't have thought to put together with the little caroler. Thanks for showing a new idea! Fantastic, love how you converted the stamp. I think this stamp set the characters are much different from the old ones! Super cute! Such festive color, love it! This is such a cute stamp set! Beautiful cards! Love your cards! So super cute! Your set is absolutely adorable! Love how perfectly it fits with images from other sets too! Very cute stamp great design! Beautiful cards! I love this stamp set. This stamp is so cute! You make it shine! Those carolers are so cute! I adore this set and your cards are sooooo cute. The alpine carolers are my favorite! They are so unique and different from what's out there. Great job! How very sweet these cards are! I love these new products from ME and you have showcased them in very unique ways! Such a darling set! LOVE the whimsical feel to it!!! So pretty! You do great coloring! This stamp set is soo cute! great job ! Love the caroler with the cupcake! How adorable! Thanks for the chance to win!!! Love pairing images from different sets. Thx for the inspiration. These little guys are so cute and love how you used them on both cards. Thanks for sharing. this stamp set is seriously so cute! love your cards showcasing this adorable set! Congratulations on creating a beautiful stamp set. I can see many uses for it. Love your cards and the Christmas pudding is pure inspiration. Thanks. Adorable! Lovin’ the new release! Such inventive stamping for very cute cards!